I LOVE this dress and this color on her. She knows that too.. that’s why she wears this color so often ;) Beautiful Meg! 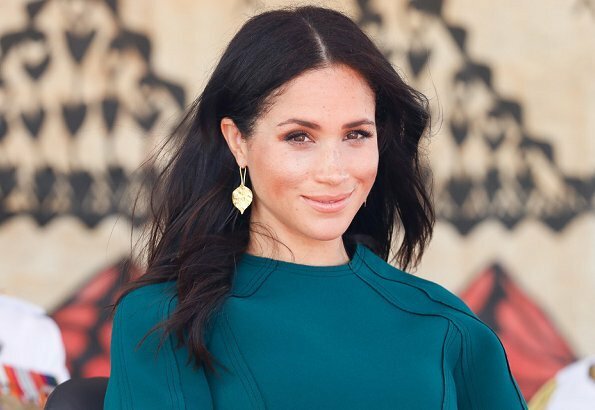 Deep green is a lovely color for Meghan. I like the clear and simple lines of the dress--I think her pregnancy tummy might be growing more quickly now! 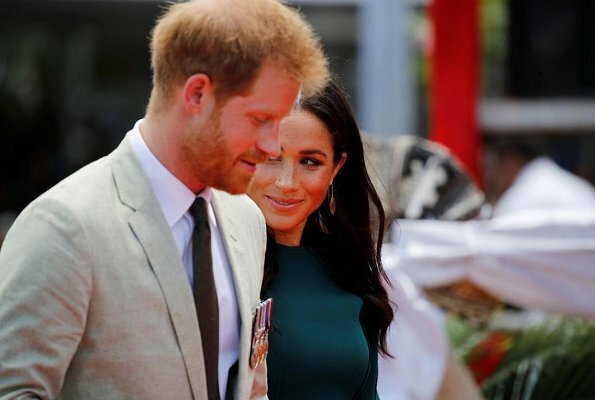 Love her interaction and expressions with Harry. This couple is a pleasure to see. I am inlove with this dress. 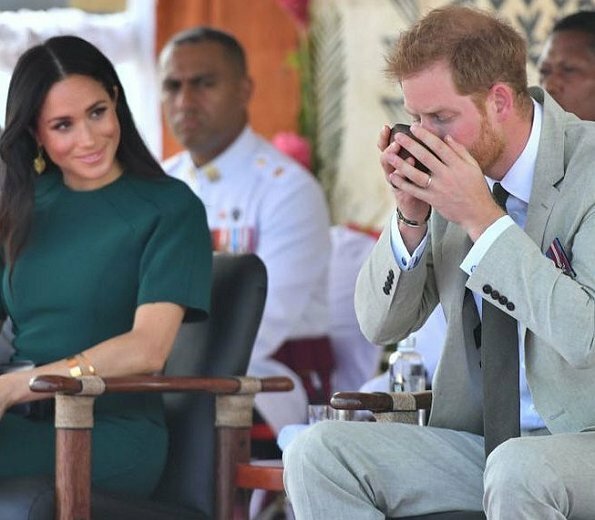 I believe that greens and blues are Meghan's color. Haven't seen her in any green outfit wherein she doesn't look good. May be boring to some but I personally prefer these colors on her. A little bit of color from time to time doesn't hurt as well. This is one of her best looks! 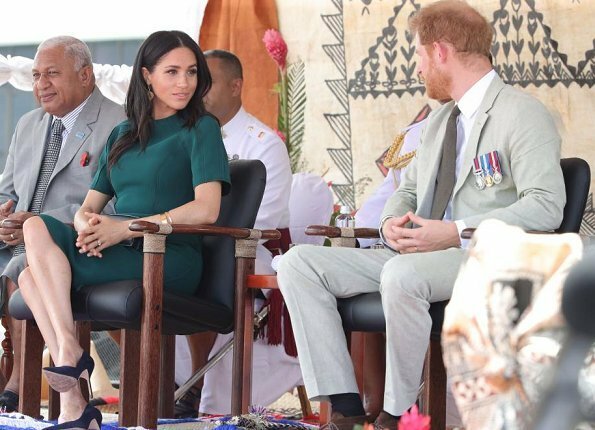 Wonderful dress on Meghan, colour is perfect for her and length too! And earings - wow! Agree it's a great colour and the earrings are gorgeous. While it must be difficult to adapt outfits for someone in the second trimester of pregnancy, I still think the dress could fit better round the bust and shoulders. Sadly the straggly hair is back but it's still well into the top looks for the tour. Great start to the day. Great colour but terrible fit for the price of the dress. But I guess we are used to that with Meghan. Yes, I think the fit is not flattering especially in the chest and shoulder areas. I think it is the cut of the dress that doesn't suit her body type, not the early pregnancy making the fit awkward. 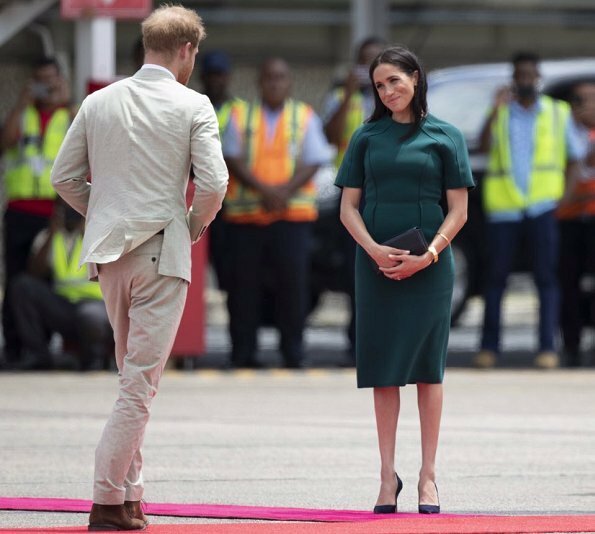 This dress is more like the type of clothing Meghan should wear. Even though her pregnancy is showing more this suits her petit figure better than some of the clothes that eat her up. On closer inspection of the material though it reminds me of a deep sea diving outfit. She seems so young on pic 6. 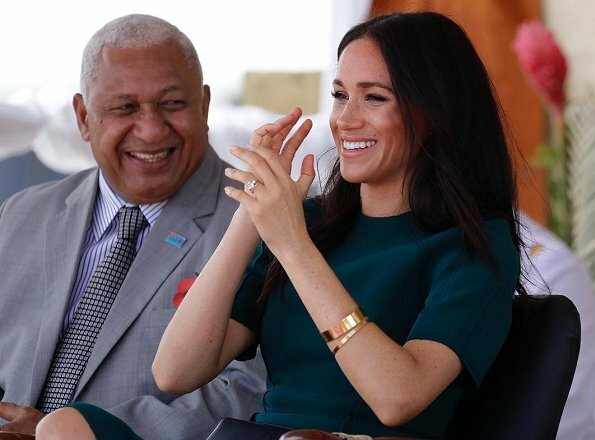 Nice colour, cut and length for Meghan. Suits her much better than the floating, floral dress she wore at the market visits. But the material looks quite warm and more suitable for europeen autumn weather than the Fijis. Hum, I am not sure I agree... The colour is perfect for maghan, but I do not think it looks... comfortable on her. It makes me think of Mathilde. I can imagine that it was not an easy task to plan the wardrobe for this trip, especially with more tightfitting items. The baby belly can pop our at any moment in this period. The idea of the dress is interesting but the execution is not good, in special around the armpits and chest. The color is nice on her. 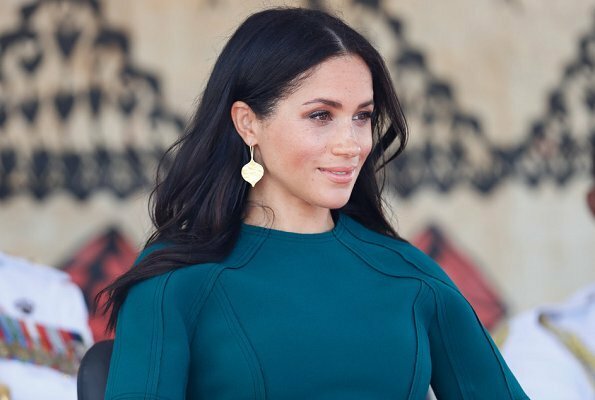 Styling and charming,Meghan is fantastic!!! She looks stunning, how becoming color to her! I love this dress. It doesn't transform well into maternity wear so it doesn't really fit her well (like many of her clothes) but it's a start. While a pretty color, not the best fit. One does have to careful and consult a good stylist when pregnancy is a factor. A very nice Jason Wu dress. Also love the color on Maghan. And simple gold earrings. Good pic. Love the dress both style and colour. Accessories good and I think her hair looks absolutely fine. finally colour! And a very nice dress, here, everything is really, really nice. My favorite thing about the dress is the lovely color, and my favorite thing about the outfit is the lovely earrings! This dress is terrific! Nice simple lines, with some detail in the bodice for the perfect touch. 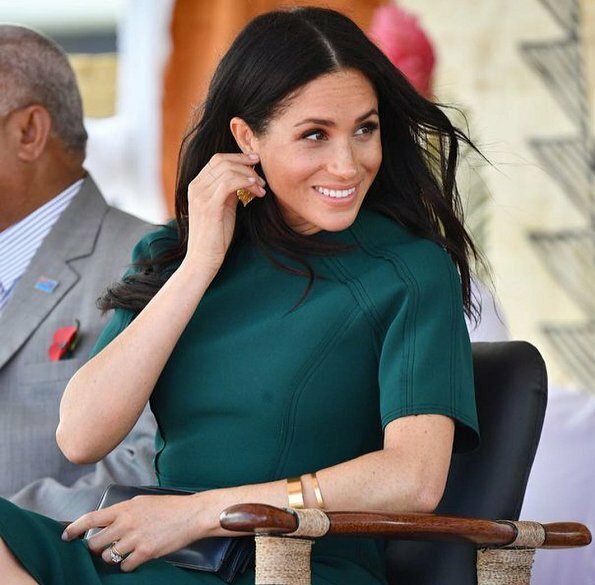 Meghan does look great in green. 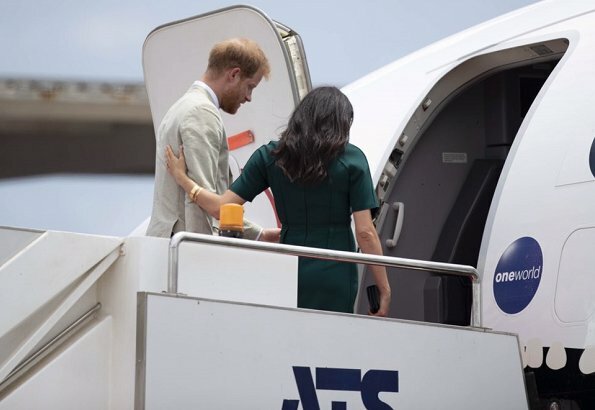 She is at a difficult time in a pregnancy to dress, and she has done a remarkable job dressing a growing bump while traveling.